Aww I made it as a fully fledged blogger today with a little passive agressive hate post all of my own. It’s like the internet has accepted me as one of their own. 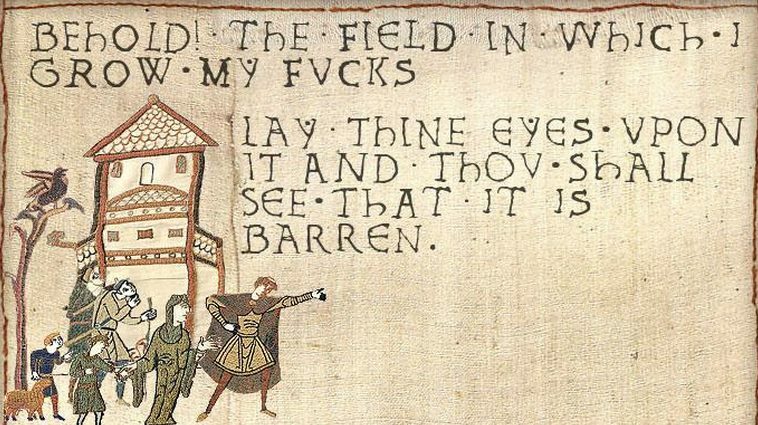 Now, the standard reaction to the comments section on anything is “don’t feed the trolls”, and yet repeating this didn’t exactly work, so I’m going to chuck a couple of statements on here, just in case anyone other than me or Mr Geek reads this. I write this blog for me. Much of my blogging is an electronic format of diary writing. It’s a stream of consciousness which is rarely edited, nor proof read. At most, it’s occasionally written to explain what’s going on to my friends and family. This is not my job. You don’t pay to read my blog, I’m not here to entertain you, so if you aren’t finding anything interesting or useful, read something else. If however, I happen to entertain you, make you feel less alone with a chronic illness or highlight something useful, then welcome to my metaphorical tree house – make yourself at home. I’m self obsessed here, so I don’t have to be elsewhere. 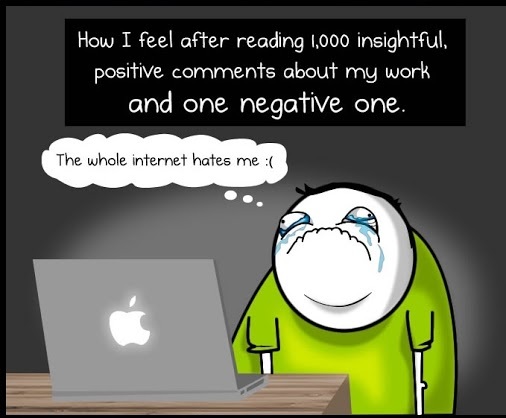 There are number of scientific, peer reviewed articles about the benefits of blogging for your mental health. Personal blogs are seen as a safe space in which to let out your inner thoughts and fears without needing to find the words verbally. It’s also a place to verbalise those things which if left bottled up, would niggle away at your state of mind and turn you into an unpleasant person. These reports identify that those who use a personal blog to talk frankly about themselves have a higher level of perceived social support. For me, I have made contact with a wonderful support network who support each other. In real life, I put on a brave face and get on with my life. Once you post online, you no longer have control of it. Probably the most important lesson I teach my kids. It doesn’t matter if you later regret what you post as there’s this thing called a screen capture. 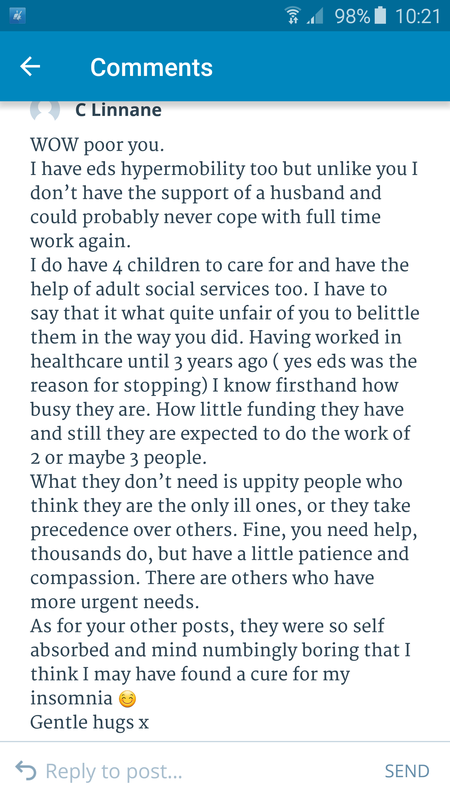 I hope this particular troll isn’t actually a troll & just another person struggling with EDS who felt wronged by my willingness to call people out on their ill treatment of service users, or felt that they have it worse and as such my open grief over the loss of my previous life is unjustified. I’ll give them the benefit of that doubt because EDS is crappy and without somewhere to vent, can make you angry and defensive. But through the magic of the screen capture, here is that now undeletable comment. And for transparency, my response. 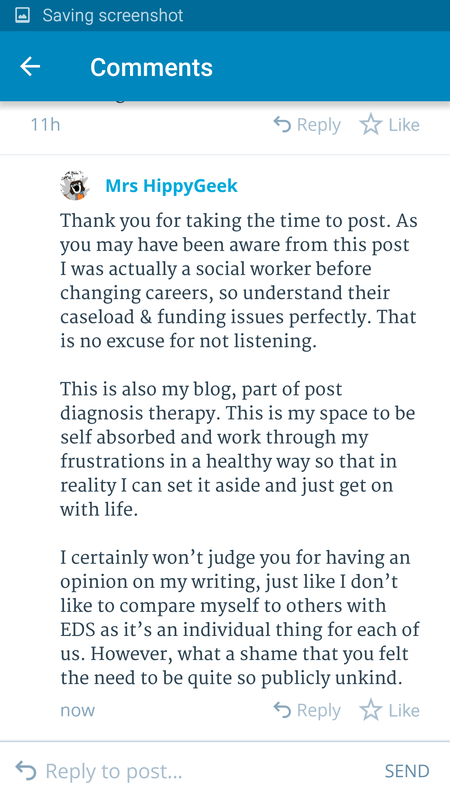 You probably need your own blog, because after a day of receiving some of the most beautiful private messages of support from my friends since I posted that response, I’ve written another self-absorbed and mindnumbingly boring post which has released all that negativity into the ether. The Leibster Award. I have it. 1. I’m having more fun than the kids painting the Warhammer figures. 2. I am rubbish at being overtired. 3. I wish I had more time to play games. 4. I’m a slow reader. But I get totally lost in stories. 5. My faith is rather dented and I’m leaning towards agnostic. 6. I’m determined to learn to speak Spanish, even though I’m finding it really hard. 7. Just occasionally, I wonder what would have been if we’d had another child. 8. I’m having great difficulty in thinking of eleven things about me! 9. I have several friends that I’ve never met, but I consider proper friends. 10. I want to travel more. The idea of warmer climates appeals. 11. I’m not very good at being girly. 1. Who is your favorite author? Terry Pratchett, without a doubt. 2. If you could travel anywhere, where would you go and why? Southern Spain. Andalusia. 4. Name something you would love to be able to do that you haven’t done yet. Retire! 5. What is your proudest accomplishment? probably when my book was published last year. That was pretty cool. 7. What is your quest? Mostly anything the dude with the exclamation mark asks me to do. 8. What is your favorite color? green. Was purple. 9. What is the capital of Assyria? there were 4, which one do you want? 10. What’s your favorite comfort food? carbs carbs and more carbs. 1. Who was your childhood hero? 2. Who would win in a fight: Cthulhu or the behemoth? 3. Tell me about your most memorable teacher. 4. What was your favourite age? 5. What happened on your 10th birthday? 6. What does your sock drawer say about you as a person? 7. Paper books or ebooks? Why? 8. If you could be a book character, who would it be? 9. Describe yourself in five words or less. 10. How do you take your tea? 11. What classic novel do you wish you’d actually read as a child? 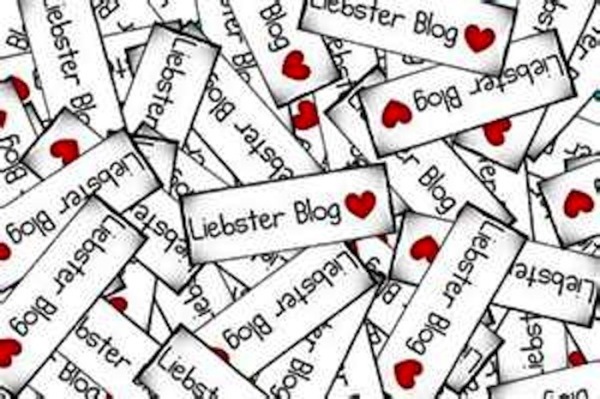 Nominate 11 blogs of 200 followers or less who you feel deserve to be noticed and leave a comment on their blog letting them know they have been chosen. 6. It’s Been a Slice! And the nomination goes to…. Me! How cool! I’ve been nominated for a versatile blogger award (click on the green button thingy on the right) by the lovely claudiabette. It’s a bit surreal thinking that people actually read my rantings! So, thank you lady from the other side of the world! The Happsters like hipsters, only happier. April’s A-Z – too funny for words! the GypsyTree because she is my favorite and my best! 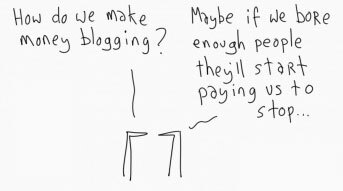 A Life Worth Living – want a blog that actually means something? I’m very proud to have this man as a friend. You should watch his film too. Barry’s Aquarium – a local blogger who loves his fish. Good reviews of local shops too. Seems I need to do a bit more reading… 15 seems a long way off. But this’ll do for now. And now for 7 things about me… Err. Seven. What, that I haven’t already blogged about? I believe in doing your best so much it’s tattooed on my forearm! Sometimes I worry that I’m not as clever as I think I am / appear to be. So I’m signing up for a PhD just to prove it to myself and test what my actual limits are as my last tutor knocked my confidence quite severely.